Shock new figures show a horror smash happened every at a rate of more than one a fortnight on both the A9 and A82 roads over the past five years. There were 144 serious crashes on the Thurso-Dunblane road in which 37 people died, while on the A82 Inverness-Glasgow road there were 146 bad crashes and 33 deaths. 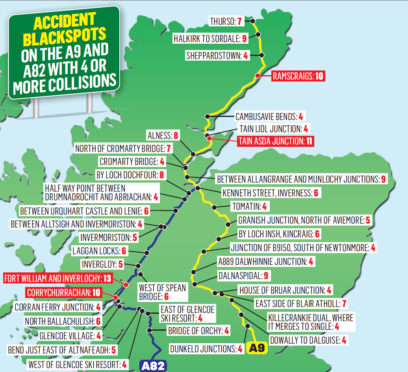 And The Press and Journal can today reveal a new map which highlights the north’s accident blackspots on these roads, based on a cluster analysis of locations with four or more collisions in which someone was hurt. Tain’s Asda junction was by far the worst on the A9 between Perth and Thurso with 11 accidents, while there were five collisions at the Granish junction just north of Aviemore, four at Dunkeld and four at the House of Bruar. The new figures, provided under freedom of information laws, only include collisions in which there were injuries – classed as slight, serious or fatal – and span the period from April 2013 to March this year. The accident data has been identified over stretches of road up to a maximum of 1.5 miles. Other danger zones highlighted on the A9 north of Perth are at the Cromarty Bridge, a stretch just north of Dalnaspidal and three different sections of road in Caithness. And on the A82, between Inverness and Bridge of Orchy, one of the worst road corridors is at Corrychurrachan by Loch Eil with 11 accidents. But there were 10 accidents between Lochend and Dochgarroch, six between Urquhart Castle and Lennie and several blackspots close to the Glencoe Ski Resort. The worst junction on the A82 was Corran Ferry with four incidents. Jack Kushner, spokesman for UK-wide road safety charity Brake, said: “The high rate of serious and fatal collisions on the A9 and A82 is considerable cause for concern. Mr Kushner added that the onus is on the Scottish Government to encourage safer driving and tackle crash hotspots with improved engineering. A Transport Scotland spokesman said road safety is of “paramount importance” to the Scottish Government, with assessments done on trunk roads annually to identify locations where three or more injury accidents have occured in a three-year period, to prioritise resources for mitigation. He said engineering, education and enforcement by partners is key for them to bring about a “revolution in road safety” as they work towards a vision for no fatalities. Local road policing inspector Neil Lumsden said that reducing the number of people killed on the roads is a “key priority” for the force. He stressed that no two collisions are the same, with various factors involved such as speeding, distraction and driving under the influence of drink or drugs. On the A9, road safety studies are either ongoing or planned for the Tain north and south, Rosskeen, Skiach, Bruar and Dunkeld junctions. And on the A82, a new junction turning vehicle activated sign was installed at Urquhart Castle recently, along with works at Corrychurrachan in recent years. Official Transport Scotland figures highlighted a drop in fatalities across all of Scotland’s trunk roads from 175 in 2016 to 141 last year, the lowest level since records began in 1970. Among the Scottish Government’s key safety initiatives is the A9 dualling project south of Inverness, which they aim to finish by 2025. But only the Kincraig to Dalraddy section has been completed so far, representing just 6% of the 80 miles to be dualled. Figures published in April also showed 10 fewer people were killed on the A9 Inverness-Dunblane road in the three years after the average speed cameras went live in November 2014, compared to the three years of 2011-13 – a 40% drop from 24 to 14. But a reduction in the HGV speed limit from 40mph to 50mph, brought in at the same time as the cameras, has been cited by many as an important factor in closing the gap between the slowest and fastest vehicles, reducing driver frustration. Mr Stewart also stressed the need to deal with adverse driver behaviour through education and awareness.